Glenn Pass is the highpoint of the popular Rae Lakes Loop in Kings Canyon NP and one of the major passes on both the PCT and the JMT. Glacier Spike lies just east of the pass, an officially unnamed summit rising to 12,500ft. Our route today on the last day of the Challenge would take us over Kearsarge Pass from Onion valley, past Bullfrog and Charlotte Lakes before climbing to Glenn Pass and the summit of Glacier Spike. Though more than eight miles one-way, the route is almost entirely on trail and was not expected to be a difficult day. I'd long since discovered that having a hard day on the last day of the Challenge can be a bit of a downer, so this seemed like just the ticket for the finish. There were 13 of us for the 6a start at Onion Valley, including Iris who had last started with us the previous Sunday on the second day. There would be no late starters today. The hike up the trail was a pleasant one, taking us anywhere from three to five hours to reach Glen Pass by way of the Kearsarge Pass Trail and the PCT/JMT. We were treated to fine views along the way of Kearsarge Pinnacles and Lakes, Bullfrog and Charlotte Lakes, East & West Vidette, Mt. Bago, Charlotte Dome and other sights. Half of us were still together upon reaching Kearsarge Pass around 7:45a but this would thin further as we continued west of the pass. There were a suprising number of backpackers coming down the south side of Glen Pass, dozens upon dozens of them, most probably doing the JMT with others doing the Rae Lakes Loop. As we arrived at Glen Pass we joined the usual group of backpackers taking a break there, eyeing our goal to the east. While we were discussing our options, one of the backpackers was overheard commenting to their companion, "That would be stupid without a rope." Stupid is as stupid does, I suppose. As the rest of us got ready to tackle Glacier Spike, Robert took off down the north side of Glenn Pass heading for Painted Lady, about 2/3mi distance. He would add Rixford and Falcor to his bonus tally, not returning to Onion Valley until later in the afternoon. Secor rates Glacier Spike as class 3 from Glen Pass, but that turns out to be somewhat deceptive. We initially started off along the north side of the ridgeline where the going was class 2 over sometimes loose boulders and fractured rock. The quality of the rock improved higher up, going to the advertised class 3 as expected. But upon reaching a false summit, we came to find there are a series of difficult pinnacles that make up the summit ridge, the highpoint being well to the southeast past about five of these. I was following Sean O up to the pinnacles and watched as he gingerly made his way around the first of these. Not finding it easy to recommend, he said he'd "check things out and come back". We waited about five minutes before realizing he wasn't coming back. Gil continued across the ridge while the others of us that were initially following thought better of it, and eventually figured out how to drop off the south side of the ridge and do an end-around through easier rock before climbing back up to the summit with some final class 3 scrambling. 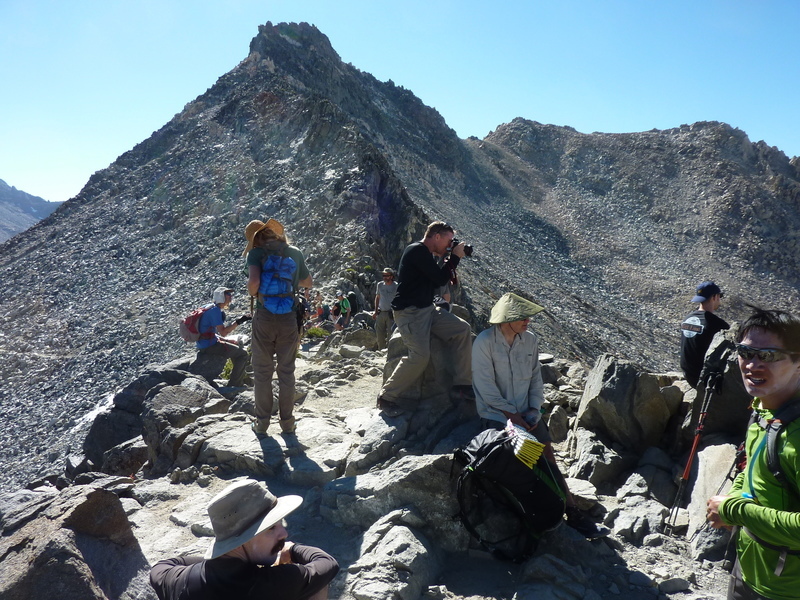 The easier way to climb the peak from Glen Pass is to stay off the ridge and on the southwest side until more directly below the summit, which a number of later-arriving participants figured out. Sean O and Gil arrived first before 10:30a, closely followed by Mason and myself. When I asked about his comment about coming back for us, he sheepishly smiled, "Oops, guess I forgot." We found a register in a PVC tube, and as often is the case with this type of container, the booklet inside suffered from water damage and was difficult to read. It had been left by the SRC (Sierra Register Committee) back in 1991, around the time they were collecting up old registers for preservation, an effort that proved to have less support than they expected. As we snacked and lunched, Sean pointed out that it would be easier to descend to the south, going through the bowl southwest of Mt. Rixford to return to the trail, avoiding the return to Glen Pass. Gil and I used this cross-country route to great success, shaving more than a mile and a half off the return. Sean, who had joined us for the initial descent off Glacier Spike, headed up the tedious-looking west side of Mt. Rixford since he hadn't been to that SPS peak yet, an example of what Eric Su had earlier dubbed as being "caught up in the SPS vortex". The scree bowl southwest of Rixford was somewhat tedious and slow as Gil and I dropped into the small depression found at the bottom before climbing back out. After that the going is much better, steeply descending through partially forested terrain with much better footing than the bowl. Back on the trail, Gil and I continued east to Keasarge Pass, arriving around 12:15p. After a quick break, Gil decided to jog down the remaining distance, myself declining his invitation to join in the fun. Just below the pass I paused to let a pack train go by, then resumed my descent non-stop to Onion Valley at a more leisurely pace, arriving by 1:40p. Gil and I were well ahead of the expected 3pm return time, unfortunate because my brother was planning to bring the cooler of iced beverages closer to the expected time. A frantic phone call to Jim roused him from his motel in Independence, prompting him to arrive half an hour later. We sat there in the middle of the Onion Valley parking lot over the next 4-5hrs, slaking our thirst and welcoming the others for the finish. Sean R, Iris and Matt came rolling in not long after 6pm, after which I headed down. Scott and Robert would return several hours later, having made a circuit by tagging various other bonus peaks, Scott in particular finishing up the ten days with a six peak effort, including Dragon, Gould, Painted Lady, Rixford and Falcor. In all we managed to get eleven of us to the summit of Glacier Spike. Scott's effort was on top of his amazing run for the entire ten days, netting him a record 38 peaks to take top honors for the Polka Dot (King of the Mountain) jersey. Sean O'Rourke had 27 peaks with Eric Su coming in third with 20. Scott, Chris Henry and myself were the only ones to complete this year's list of 10 Challenge peaks. Sean Reedy, Iris Ma and Sean O'Rourke also managed 10 Challenge peaks with one or more alternates from previous years. Iris became only the second woman to complete 10 Challenge peaks in 16 years. In all we had about 50 participants (an exact count is difficult because we had some unexpected last-minutes entries, a few of which I didn't record their names). A full accounting of everyone's efforts can be found on the 2016 stat sheet.